The Anniversary committees are working frantically to get their events ready for this year. Invitations for the Gala Party will go out in February. Meanwhile, save the date: March 8th. For people who are interested in working on the September Symposium , send an e-mail to to Mui Ho. You will be contacted regarding the committee meeting schedule. The retreat in September 2002 was a great success with more attendees than ever and a most enjoyable program and weekend. Also we had some enthusiastic new comers. It appears that the finances worked out, with special thanks to Heather for keeping the books and Lisa Kleissner for covering of the musicians' costs. Many thanks to all of you. Plans are underway for the Anniversary Retreat, to be held on September 19th-21st, 2003. As some members have chosen to do in the past, the option to stay an extra night (Thursday the 18th) is offered and encouraged. The lodge at Westerbeke will accommodate 51 people on a first come first serve basis. Camping space is available, both indoors in our meeting room, in the round room, or outdoors in tents. Furthermore, rooms at three local small and fairly inexpensive hotels may be reserved if we exceed Westerbeke's capacity. Each year, we have traditionally collaborated on a group art project. In discussions for next year's project, the idea of a (fairly) permanent labyrinth on the Westerbeke grounds had a lot of appeal and support. It would be a contribution to Westerbeke that could have OWA's mark on it somewhere: names, hand or foot prints or otherwise. Yoga instruction will be available. There was a request for people to show slides of their work. One idea would be a carousel or PowerPoint show of slides running separately from the round circle introductions. Please e-mail me and the rest of the committee with any ideas you might have. OWA will pay for one retreat for each Steering Committee member per two year term. The Retreat Committee may provide other partial or full scholarships, funded by donations collected from members. Art Project: Leslie Allen, Barbara Dittrich, Debra Amerson, Sarka Volejnikova. D'vora Treisman, former OWA Administrative Assistant and newsletter editor for many years is now living in Barcelona where she is writing a book about her move, at mid-life, to a new country. She has also started Barcelona Footprints, a business conducting private architecture and shopping walking tours of the city. Recently our members Pauline Chin and Tracey Bornstein visited her and had a wonderful time. D'vora invites you to visit her website. Late one summer evening we went to an outdoor concert -- one of a series of city-sponsored concerts given in many of the public parks. Concerts here in Barcelona rarely start before nine: this one began at ten fifteen and let out at midnight. It was a classical guitar and piano recital, held in Antoni Gaudi's Parc Guell, a singularly unusual space and one of the city's many treasures. Antoni Gaudi i Cornet, the most famous of Spanish architects, was a Catalan who came to Barcelona from nearby Reus to study architecture, and remained here to become one of the foremost architects of the late nineteenth and early twentieth centuries. He worked in the style called Modernisme, the Catalan version of art nouveau. Like art nouveau, modernista designs are sensuously curvaceous and abounding in floral motifs. But whereas the work of all the other modernista architects have something recognizably in common with each other, utilizing the floral motifs of the period as decorative elements, Gaudi's mature designs incorporate the forms of nature into the structure itself so that each stands out as a one-of-a-kind fantasy. 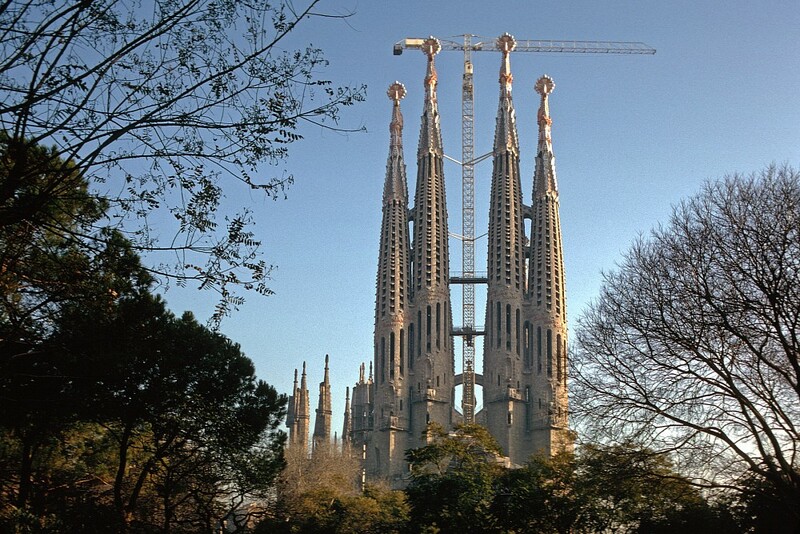 They are almost surreal, but unlike the harsh surreal paintings of his countryman, the Catalan painter Salvador Dali, the designs of Gaudi are soft, lyrical, and often whimsical, and in the case of his unfinished church, the Sagrada Familia, the emblem of Barcelona, even ethereal. Even now, a hundred years after it was created, his work still looks modern. Parc Guell was commissioned by Eusebi Guell, Gaudi's most frequent patron, and was meant to be a community of garden houses for the wealthy. The area was laid out, the park and two of the houses were built, but the rest of the project was never finished. What remains is one of the world's most unusual parks with arcades made from natural rock, a colorful, tiled, serpent fountain, and a large open plaza rimmed by a curvilinear bench dressed in a colorful mosaic of broken tiles called trencadis with a view overlooking Barcelona and the Mediterranean. For the concert, we sat in the Sala Hipostile, a pavilion under the plaza that was intended to house the community market. It's a spacious, open structure that backs into the hillside and is supported by Doric columns, those at the outer edge leaning inward so that when you look across the space, the vertical lines are not parallel. If the effect upsets my equilibrium and even makes me feel slightly ill, it is nevertheless very grand and other-worldly, and reminds me of what Valhalla must look like. Another day we went to see Gaudi's Casa Mila, a seven-storey apartment block, nicknamed La Pedrera (the Quarry). Made of white stone, it seems to me that Gaudi was thinking of the ocean when he designed it. It undulates like the waves of the sea with no straight lines anywhere -- not in the façade, which rolls back and forth while it continuously curves all the way around a city corner, not in the hallways, not in the apartments, nor on the roof -- a moonscape of giant chimneys and ventilation towers dressed in the trencadis method of broken bits of tile, looking remarkably like characters from 2001: A Space Odyssey. Gaudi created this phantasm in 1905. La Pedrera is owned now by one of the big banks, and they have made several parts of this private apartment building open to the public. One part is an art exhibition space that was redone with straight white walls for hanging pictures, but on the way in you pass through the courtyard and up the stairs where no surface is plain -- it's all a coalescence of curves and textures and colors. I've seen exhibits of Goya and Chagall there. Another part is an apartment that is furnished in the style typical of the period. It is interesting to see the rigid Victorian pieces mixed in with the soft curvilinear designs of Gaudi and other modernista designers. The attic, which was once used for storage, has been opened up and now serves as a museum. It is a fascinating place to study the form of the building, as all the brick arches are exposed there. From the extraordinary roof you can again see all of Barcelona and the Mediterranean beyond. 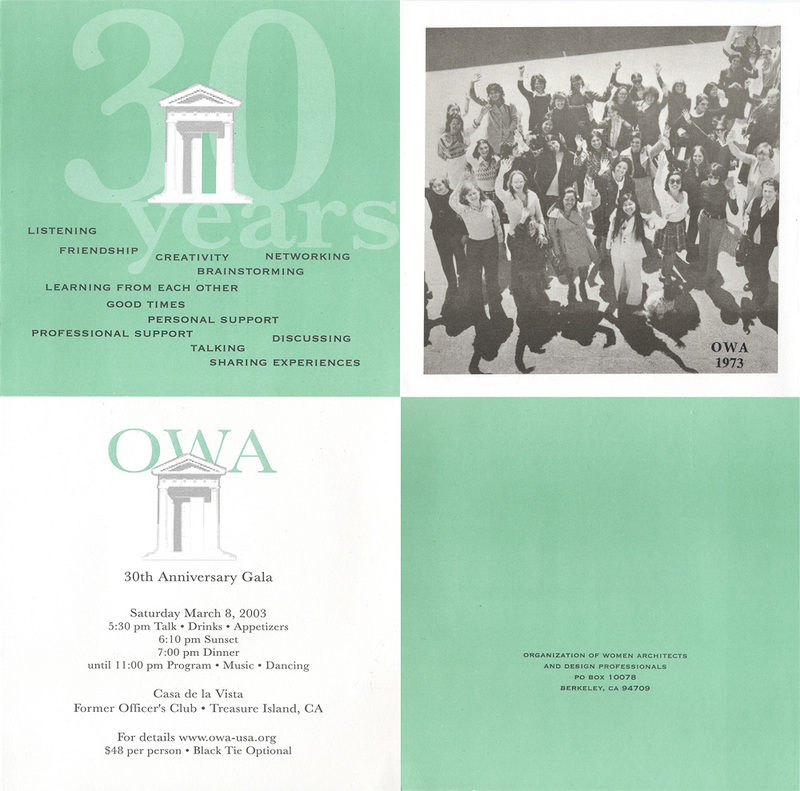 For the 30th anniversary celebration I am putting together an address list of former or lapsed OWA members. So far, I have gathered over 100 names, but few corresponding street addresses. Anyone in contact with former OWA members, please have them contact me or write to 2363-44th Avenue, San Francisco, CA 94116, so I may update their information. Thanks for your help! I'm delighted to hear from you. I live in Puerto Vallarta, Mexico, so it's not likely that I could attend any events. But please keep me posted just in case. Mail to Mexico is slow and impossible even at times. I receive my snail mail at the address below in Santa Cruz, but that is only forwarded to me once a month or less. If you can just email me the information, that would be best. Congratulations to all of you for your accomplishments with OWA. I have wonderful memories from those early days. How heady it was to sit in a room with 30 or 40 other women architects, planners, and landscape architects after being one of ten women in a department with 800 architecture students. The only female other than the secretaries was the librarian. I thought at times I might be the first woman to get a license!!! How isolated we all were then. I would also like to bring your attention to Pat's book "By the Grace of the Sea: A Woman's Solo Odyssey Around the World," a best-selling travel memoir (McGraw Hill/ International Marine/ Sept 02) For more information, visit Pat's website. *Does not include Retreat expenses. Retreat Committee has a separate account. 1. Health Plan Account must be put into business account along with other OWA business accounts at Bank of America. Tara Lane to work out transfer of funds with Janet Crane. 2. Tara to set up online banking system with Bank of America for all OWA accounts. Each committee responsible for funds will have a separate passcode for their account, as well as a master passcode for the steering committee treasurer and founder to have access to all financial information. This will be set up during the first six months of 2003. 3. Other items discussed were putting OWA accounts on Quick Books instead of Quicken which is preferred by our Accountant, and talking to an investment advisor for 50% of the funds in the money market and health plan to increase interest earnings over the long term. 4. Purchase of a used computer to handle bookkeeping and other correspondence for OWA. Tricia will present her work and talk about Venetian plaster that she uses in many of her murals. Tricia has a degree in painting and a minor in print making from the University of Colorado. She has done mural work, wall finishes and Faux bois for residences and businesses in both New York and the Bay Area. Casa de la Vista is the former Officers Club located at California Avenue and the Avenue of the Palms. After serving over two years on the Steering Committee, Lavina Liburd is moving on to concentrate on her graduate work in UC Berkeley. We are happy to announce that Kathleen Cruise is coming on board as a Steering Committee member this January .